In Oregon, participant Alradi Abdalla from Sudan took the helm of the boat on a tour down the Columbia River as part of the group’s weekend activities. Excitement, shock, and amazement: Disability rights advocates from across the continent of Africa expressed all these sentiments as they attended meetings in Washington, D.C. on their International Visitor Leadership Program (IVLP). The technology and services available to people with disabilities, such as mandatory elevators in public buildings with multiple floors, surprised Ramla Mohamed, who said that that the idea of accommodating people with disabilities is still new to the Kenyan government. “We still have a long way to go,” she said. After their stay in the nation’s capital, the group traveled to Ohio, Oregon, and Colorado to explore how governments, non-profits and the private sector work together to better the life of those with disabilities. “I have three goals,” Musa said. The first goal was to better understand the wealth of information about disability rights in the United States. Second, he hoped to create long lasting connections and networks here in the United States. The third, and most important goal for Musa, was to create a strong network with other Africans. Jean Nzaou of the Republic of Congo noted that in almost every place they visited in the United States, the group had access to amenities for people with disabilities. Even after having traveled the world, Jean said the United States stands out. “Everyone is on equal footing, and there is equal opportunity,” said Jean, adding that in his country he does not have the same opportunities for career advancement as other engineers. Jean noted how happy he is to see government officials with disabilities rise to high level positions. He said someday he hopes that his country can achieve the same. The participants all noted how they gained new insights on their IVLP that will help them advocate for the rights of those with disabilities in their respective countries. They also noted how they have never felt more empowered to create change. 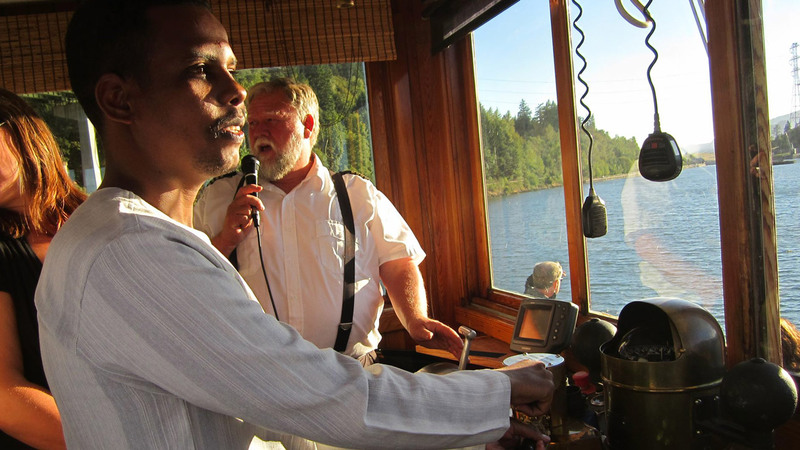 In Oregon, blind participant Alradi Abdalla from Sudan asked to take the helm of the boat on a tour down the Columbia River as part of the group’s weekend activities. Following the captain's commands, he turned the boat entirely around, and then rang the ship's bell as his fellow participants shouted “empower.” As he disembarked, he commented that he “forgot” about his disability during the experience.